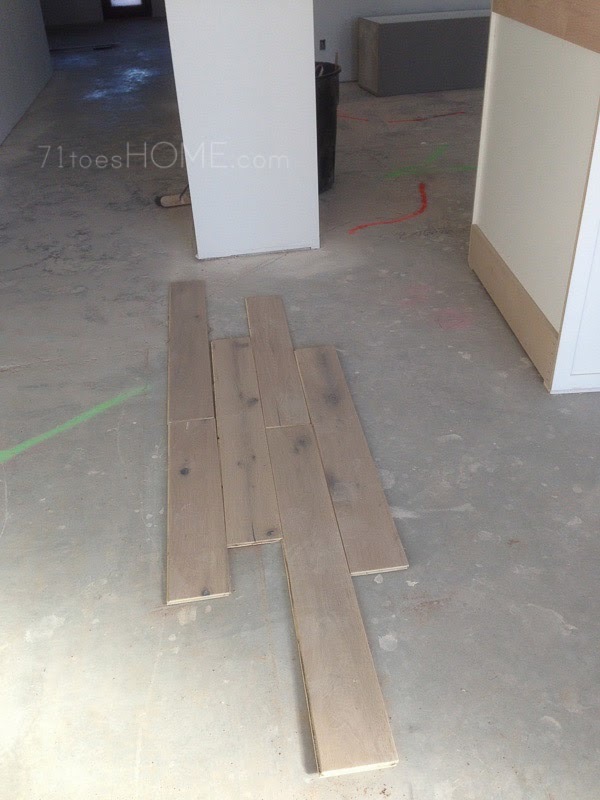 71toes H O M E: flooring---please help! This picking-out-wood-flooring has been killing me for the last month. Yeah, shouldn't be too hard, right? Ha! There's a super expensive brand that I love ("Du Chateau") that we cannot afford. I think this is so beautiful, don't you? 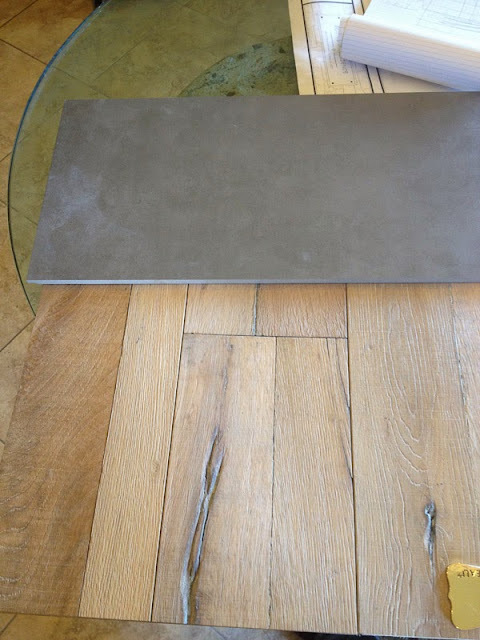 So I've found this flooring that has a lot of similar finishes to that. It's called Provenza. I pretty much decided on the "Fossil Stone"color forever ago, but for some reason I cannot bring myself to pull the trigger. 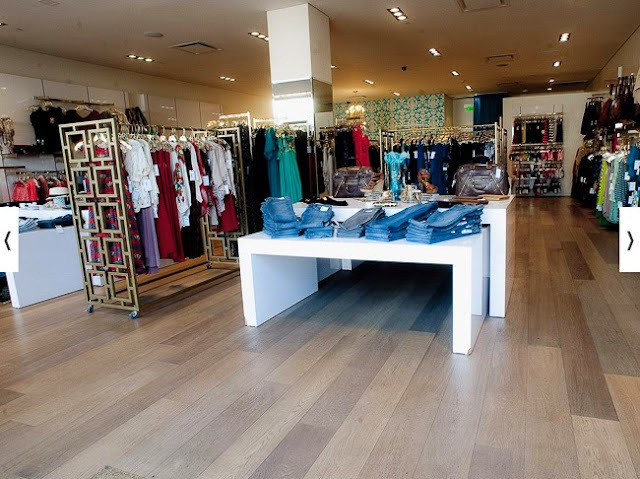 The one on the left below is Provenza Old World "Fossil Stone" and the one on the right is called Provenza "Heirloom Liverpool" and it is apparently the exact same floor but cheaper because the planks are slightly thinner and not as long. 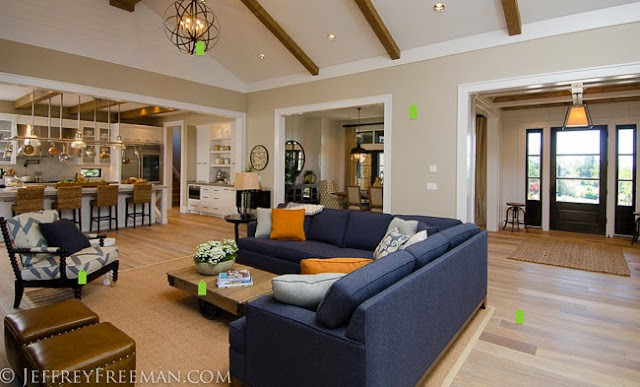 The problem with all those, although they are all listed on Houzz (in my houzz profile on the left in my "flooring" idea book), no one tells the exact specifics of what wood it is. They all say something to the effect of "white oak" or "quarter-sawn" yada yada yada, but I need details, people! So, my pleading question of the day is does anyone know some great flooring names that can help me out? If I go with one of these two below, which one would you pick?? Or this smaller-plank Provenza "Liverpool"
Am I going to be bugged by all those knots down the road or will what I chose for furnishings compliment it perfectly? Send ideas or advice if you have any! I think if the knots bother you on a small scale (and they do look fairly knotty to me), they will REALLY bother you on a large scale once they are installed. That's not to say that the selections aren't beautiful (they are all fabulous), but if they aren't what you want, you will always be bothered by them. Floors are such a mood/tone setter for the house. I lve the ones on the right with variations in the color but fewer knots. I like the fossil stone. Now only you can know what is going to bother you, but coming from someone who has had 3 different kinds of wood floor, all different colors, finishes, and even wood. I think that some knots and texture is great when you have kids. It hides the little imperfections you are sure to get in a very short period of time. So while you might like the "cleaner" wood it is also more likely to show the dirt, spots, and scratches that are inevitable with a big family. So I think the question is not are those knots going to make me nuts? But more on the scale of would I rather keep some of the texture in the wood to hide the scars from use or would I rather have the clean look and be okay with the character my family adds to the floor themselves. We have a transitional style to our house and so I like the wood we have now, it is medium dark and has some knots but it pretty consistent in color and everything else so it adds warmth without being terribly rustic or off from everything else. Good luck! I think it is really difficult to go wrong with wood no matter which one you pick! I agree with yasmara. 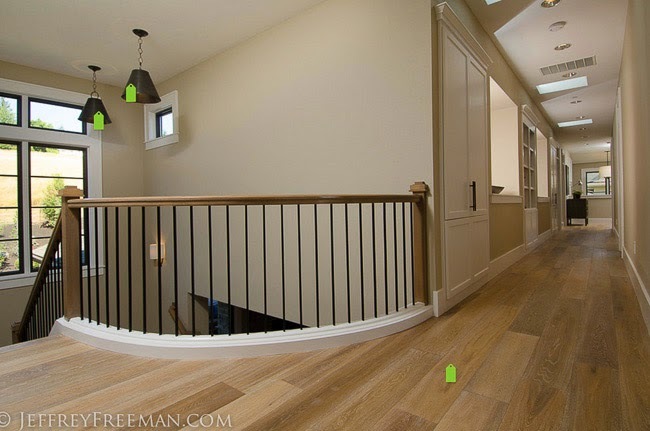 The flooring on the right (weathered ash) is my favorite. Thanks so much for going to the trouble to catalogue all of this. We have always had the dream of building or remodeling someday, but I can't stand the thought of completely reinventing the wheel on every choice! I love your style -- the perfect mix of contemporary but not too cold. We had our wood floor refinished recently and stained a different color, and it looks fantastic. It wasn't expensive (though moving furniture was a major hassle), so if ten years down the road you aren't crazy about the color, refinishing is so easy and will give you a totally different look. I have read your blog forever....but shy to comment. However, this house stuff is getting really fun...I know easy for me to say I am not in the thick of it!! I LOVE the Fossil Stone. I agree with the comment above...I think some knots help with hiding the wear and tear our little ones add to a wood floor. I think the knots make the flooring feel more rustic than modern. If you want to infuse a little warmth into the modern, than the look may work. I'm worried that combined with your rough hewn beams, you may be taking your modern house into a less modern zone. Choosing flooring is the worst! I had about 10 sleepless nights debating my wood floor decision! 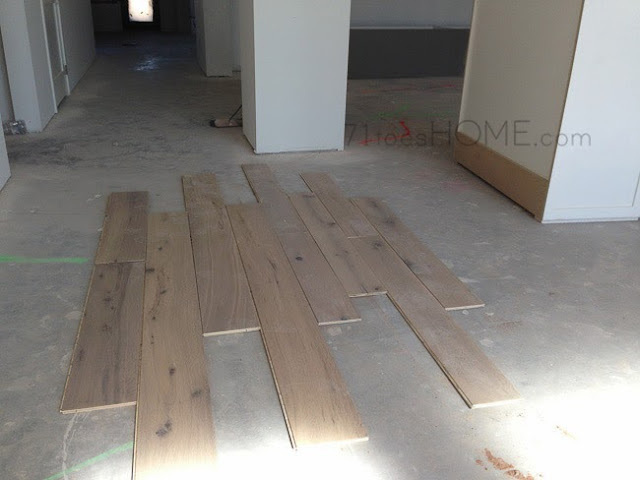 We actually used Provenza flooring in our home and love it. I was so close to going with the Old World, but went with the African Plains Black River instead because I have really young kids and felt like the more distressed, the better! I actually love both the Fossil Stone and Liverpool options. And I think the knots add a ton of character to an otherwise run-of-the-mill floor. I think it totally goes in line with the contemporary style of your home, and as you said, that will also come with your furnishings and colors and such...and the good thing about having some knots is that if you scratch or ding the floor, you can color it in with black marker or a wood stain pen and you'd never know the difference. Flaws stick out like a sore thumb on an otherwise flawless floor. I also agree with Rebecca...I think if you take all the knots out, it resembles laminate flooring more. What about the Provenza Metallics Luminous Pearl? Or any in the Epic line? I agree with what yasmara said -- I'm guessing the knots will be too rustic and drive you bonkers. my vote is for the fossil tone. its gorgeous! i think you can pick furniture that will complement it well. the wide planks are what makes it so awesome. i wouldn't pick the narrower ones. and the weathered ash just seems so fake plasticy looking but that could be just purely from the lightning and angle. heres the order i'd go: fossil tone, weathered ash, provencal liverpool. whats the one in the first pic at the top of the page? is that the fossil tone? All are beautiful! 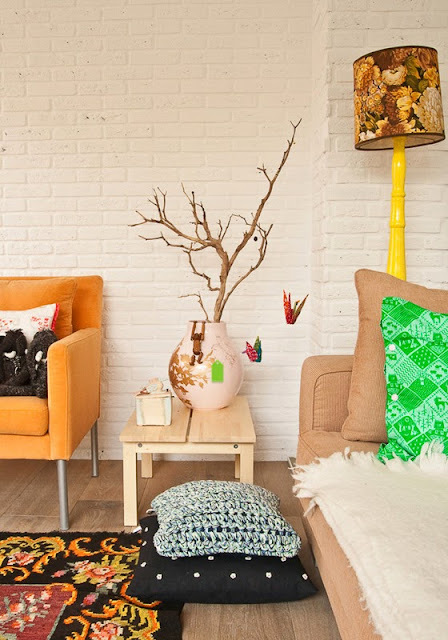 I truly don't think you can go wrong, it is about the way in which you decorate the the home. Plus the 'knoty-ness' might help tie in the timbers in the back. We just built and the flooring was tough for me, but the carpet was the worse for some reason! I didn't worry as MUCH about the color as I did the durability of the wood (pine vs. walnut or oak etc) and the style (because we did a solid wood, not engineered so if I ever grow tired of the color we can have it sanded and re-finished.) 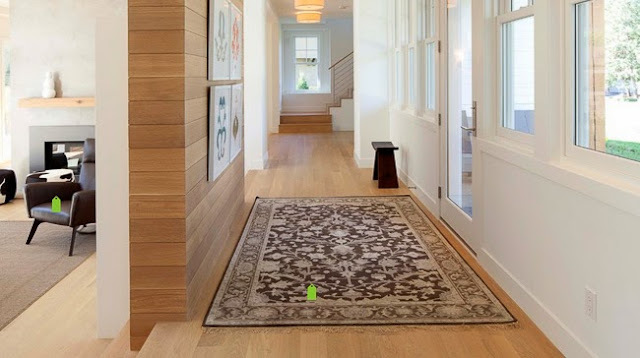 Not to throw you for a loop, but have you seen the mixed width hardwoods? I still wish I had been able to talk my husband into them! 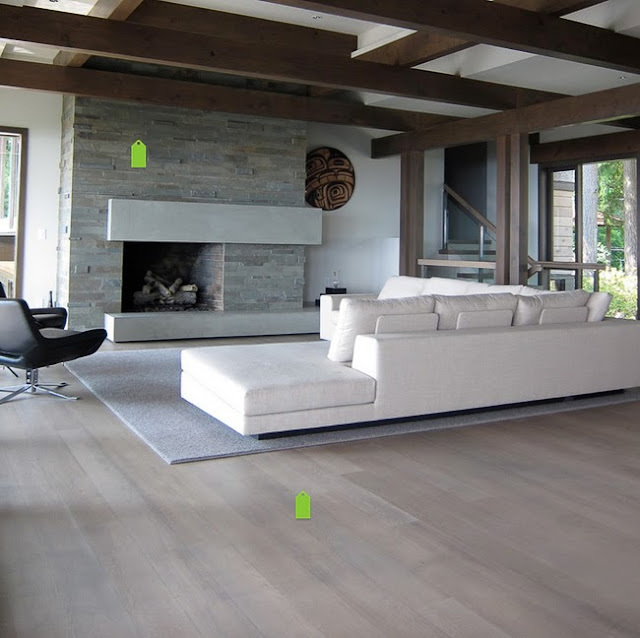 Here is a link to a 'textured' wood floor in mix widths with a contemporary vibe: http://eya-com.vps-eya-com.vps.ezhostingserver.com/wp/wp-content/uploads/2012/02/shaw-random-width-better.jpg, or another image with mix width: http://www.houzz.com/photos/3767759/COVERINGS-2013-contemporary-spaces. 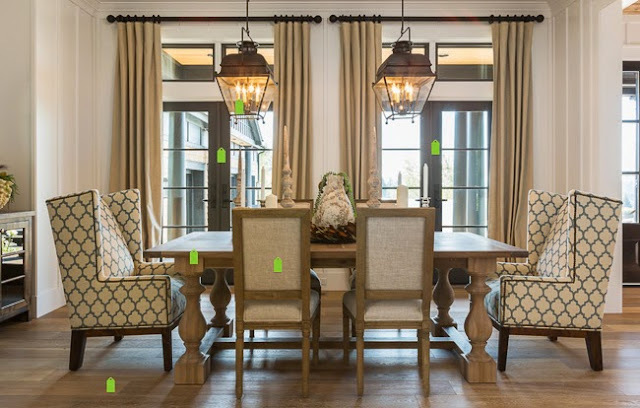 Also, I think your 6th picture, which you say you like but maybe too yellow for you, might actually be bamboo flooring, http://www.houzz.com/photos/5219218/Wando-River-Private-Residence-contemporary-kitchen-charleston. Which comes a limited number of colors. It is super eco-friendly and durable (we had it in our first house, if we didn't have a 'rule' about doing the same thing twice I would have it again). Have fun! I am enjoying following along in your building process! I like the thicker slats but I've learnt from experience if something might bother you take that as a sign. You will just analyze it after its put in. Well, I was totally set on Weathered Ash until I read the comments! I like that it has a warmth to it without being rustic. If you don't like knots, I do think they will bother you in a large amount. But I also agree that the knots will detract from scratches. The Fossil Stone is lovely, but the fact that your gut doesn't say this is the one makes me think you know it isn't for you. You know, that whole thing about listening to your intuition leads you to select what will make you happy in the long run. I just read a designer that suggested making a list of adjectives of how you want your house to feel and then run those words over every purchase you are thinking of making. If it doesn't match your list, then don't get it. Hope this helps! I think your house is going to be beautiful! 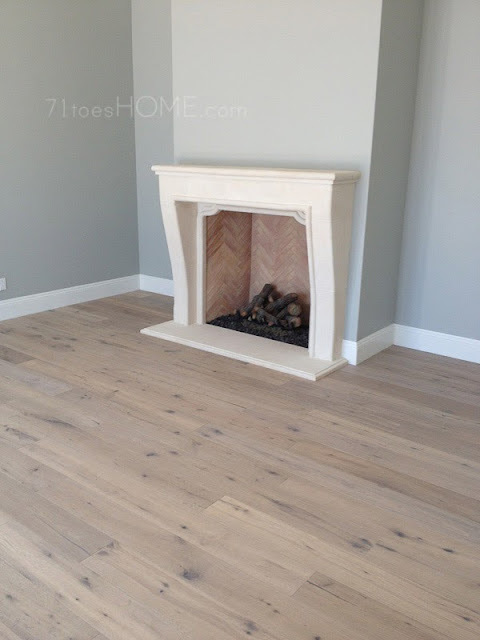 Do you have the option of going with a white oak and finishing it on site? 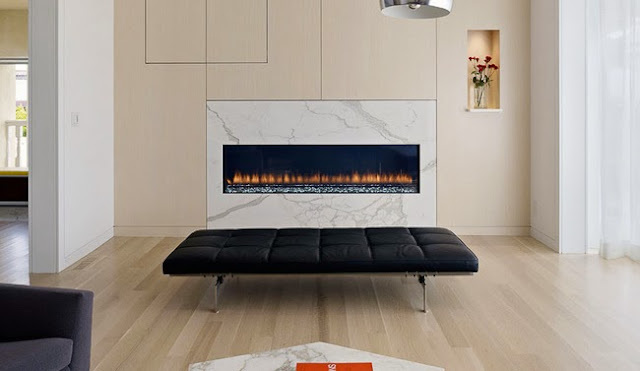 We have both floors that have been finished on site and engineered floors in our home, and I love that the ones finished on site don't have any gaps - probably would help with the contemporary look, too. I love the fossil tone!! I like the weathered ash best . . . . of those pictured in the last photo. Good luck! We just did wood floors last summer and I actually really like knots. I have young girls and whats great is we just color in a scratch or mark with a sharpie, looks like its meant to be! We also had our wood layed on the diagonal and we LOVE it! More expensive and more waste, but it looks amazing! If it's down to what you have in the last picture of the post, my choice is the flooring on the far right. No knots make it look clean and contemporary. Love it! I agree about the flooring without any knots looking quite fake and almost laminate-like... I think the knots add a lovely character, and I definitely agree about them hiding all the dings and scratches which are certain to occur! And I am sure you will put rugs down etc which will lessen the effect of the knots too. I also think that mixing "styles" is important. It helps tone down all the contemporary elements elsewhere and softens the space up a bit. I like the knots-they draw you in and add just the right touch. 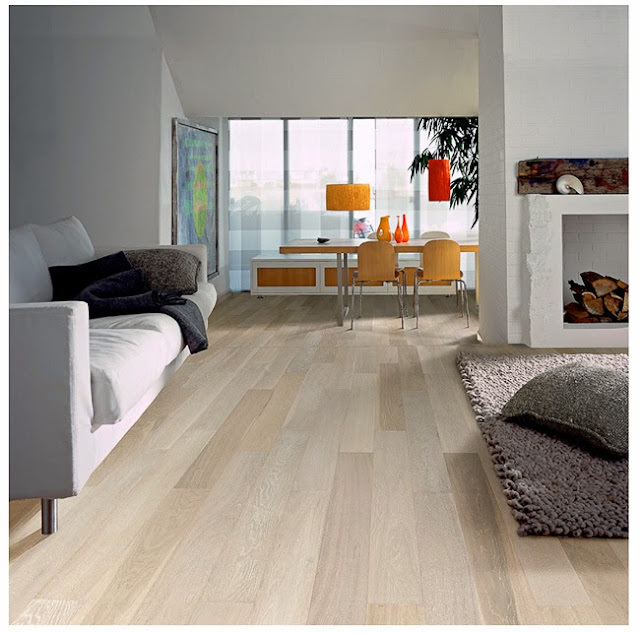 We have just layed our timber flooring & had a VERY hard time in deciding! I am SO happy with the result. 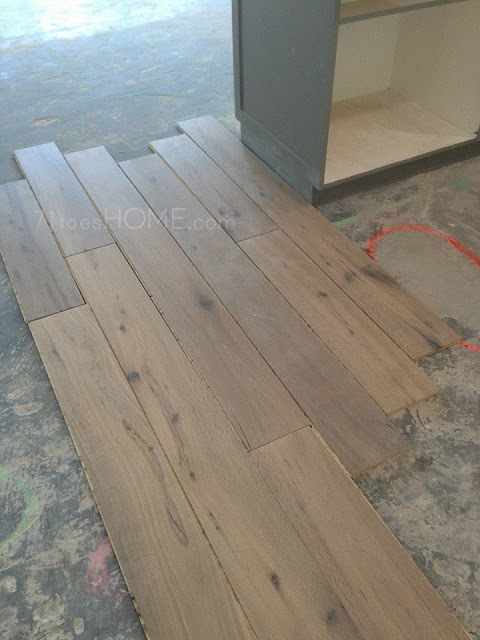 Im in Australia so the wood we decided on was spotted gum select grade, ( sorry but I REALLY dislike knots in wood) its varying colours of light, semi dark brown with greys & looks very similar to the photo you like, after the Fossil Stone. 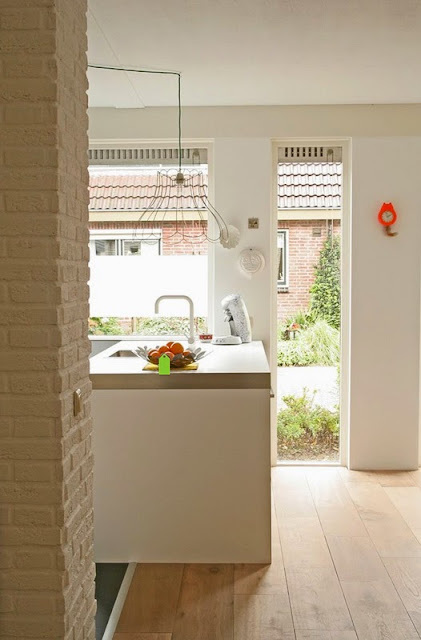 We have just installed our very modern white kitchen with the rest of the house being pale greys and whites which is similar to what you are doing. It all looks lovely! We just built last year and it's so crazy and stressful. But, we have wood floors through out our house and I love them! My advice is get the wood that naturally looks a little worn. As nice as those clean no knot wood looks after a couple days you will be sad because there will be scratches and dents in the wood. Our flooring is hand scraped and has dents and knots throughout. We got the hardest wood we could find and afford but, even so, chairs scratch and kids roll whatever across it. But, it doesn't bother me so much because I have natural scratches and dents in my flooring anyway. I hope this makes sense. So, I guess my advice is don't worry about the knots you will be grateful when one of your kids drops a can beans on your floor! I am a complete stranger but, love your blog. You are a wonderful example of motherhood! Good luck with everything! I love the wide planks...rustic means forgiving too. I imagine the knots will drive you crazy later if you are worried about it now. :) Go with your gut. It's so fun seeing the building process on here! I'm not sure I should really be commenting on the choices of someone I don't actually know :) but....I too love houzz and get frustrated when the product details aren't given. I actually don't usually mind the knots in wood but maybe it's the color of fossil stone with the knots that is throwing you off? They stand out a bit more with this particular wood I think. I love the direction you're going with your choices and I think if it were me I would go with the weathered ash (unless you've already ordered the other and in that case I take it all back! Ha!). Good luck! The wood in a lot of those pictures is Douglas Fir. It weathers to a nice smooth, grey tone that fits perfectly with a contemporary home. Check out this website for examples http://dinesen.com/ A lot of people in the industry say you cant use Douglas Fir for flooring, but its used a lot in high end homes. Hope that helps! Good luck. I think you've answered your own question. As I don't know you it seems strange to comment, but, I think your gut is spot on in this process and you should go with it and not second guess (MUCH easier said than done I realize!!). If you gut is telling you the knots will annoy you - even if your brain is telling you something different - trust the gut. Decorating/building can be a form of art. Art is about a feeling not a thought. I've been through the building process several times and while everything certainly doesn't turn out exactly like my vision, I have yet to regret going with what felt right for me at the time. Congrats on the "new" house and your clear view of what you want! It's beautiful! Cary, I would love to see a picture of your fossil stone. Do you STILL love it? I agree with most here...if the knots bother you on samples, they are going to drive you crazy when it's all you're looking at on your floor. Weathered Ash would be my choice! :) Can't wait to see it all done. Thanks so much for documenting it! It's opinion, but the knots are great! They are going to hide dirt/scratches/life so well. You will love it. Once you have the house decorated, you won't even notice them either. They will be so subtle. I think go for it. Seems like most the looks you like and post don't have knots. I think the knots are pretty but they do stand out with the light finish. I think both are nice choices but to stick with the contemporary look the weathered ash is amazing. My friend used knotty alder years ago in a very nice kitchen and she was sick of them in a year. Too much going on like looking at leopard print every day of your life! It's such a big expense so I would say stick with more neutral patterns for these big budget items while still getting the look you love. How fun! It's going to be amaz! Thanks for sharing with us! Provenza "liverpool" all the way! ! I feel your pain. We are remodeling our condo and have decided to use hardwood floors throughout. The choice of floor was by far, the most difficult. I also wanted clean, contemporary, and forgiving. After MUCH deliberation (two months of hauling around samples) I finally decided on weathered ash (I needed the grey tones to pick up on my cabinetry). It will be installed after the holidays....so nervous and excited. Will keep you posted! What did you finally decide on? I was really interested in your blog because I am struggling with the exact same decision! 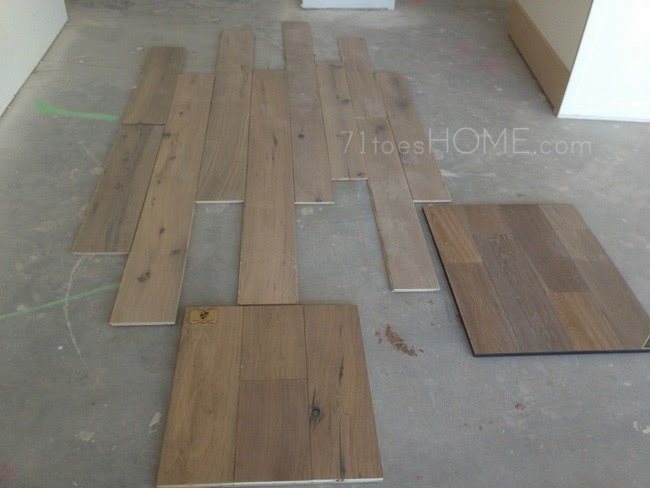 We just bought a new-construction, contemporary home and are choosing the floors. We loved Du Chateau, but eliminated it due to costs - went to Provenza (London, then Liverpool - loved the character and imperfections) but then saw the sample in the home next to our charcoal and light grey cabinets and thought the character might be way too much going on. Now I'm rethinking like you are and wondering if we should go back to our original idea, which was oiled oak finished on site. This is crazy - I can't wait til this decision is made and I can just sit back and enjoy it! Part of me still thinks the character of the knots will be a nice foil to the other, more modern elements and will add warmth. We are going to look at the samples one more time tomorrow, and then it may be back to the drawing board for something more contemporary. Good luck and please post pics of what you've chosen! I am Love, loving your house blog. You've inspired me to start a house blog of my own. It will be so fun to have everything documented some day. We are waiting on the city to approve our plans, then we're ready to build here in Utah. :) I had a question for you. I have the weathered ash sample sitting here in my living room and i Love it so much. Are you worried about the uv oil finish at all? Most people don't know much about it and I'm not finding a ton of info online either. Advice? Lisa, I'm not worried about it because my friend has it and says it's so incredibly easy to take care of. I hope all my hopes come true and it really is! It is installed now and it is really beautiful but really dirty with all our contractors coming in and out. I hope it will all be ok, but I sure love it! Curious! Did you install Weathered Ash or Fossil Stone? How do you like it? Oil Modified Urethanes are petroleum based with a mix of synthetics gums, plasticizers and other film shaping fixings that deliver a sturdy, dampness safe covering. About whether the completion will golden, leaving a warm common look. 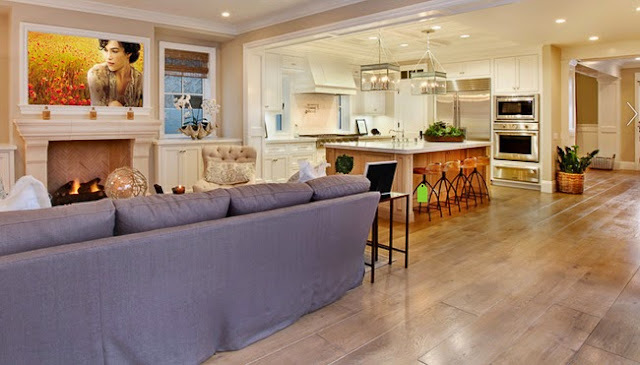 Oil based completions are less lavish, feel Hardwood floor refinishing smoother to the touch and have a tendency to have a wealthier look than water based urethanes. What is a good price range for Provenza Fossil Stone flooring? per sq foot? How is your floor holding up? I heard some complaints regarding color fading. I am looking at using Fossil Stone and wanted to see how you like it? You’re home is beautiful! So glad I found this run down because I literally was just going through the same process. Love Du Chateau but too $$ and liking this color better. Thank you! !